Hearty enough for dinner, full of winter veggies, and appealing enough for my teenager to eat (that’s darned good for raw kale), this is the top favorite deli salad at Seattle’s PCC Natural Markets. I’ve adapted PCC’s own recipe and Cynthia Lair’s version from her whole foods cookbook Feeding the Whole Family. The brown rice setting works fine for wild rice on my rice cooker. I also keep a package or two of shelf-stable pre-cooked wild rice from Trader Joe’s on hand for recipes like this one. This salad takes while to chop, but it’s totally worth it. It would make a good work lunch. 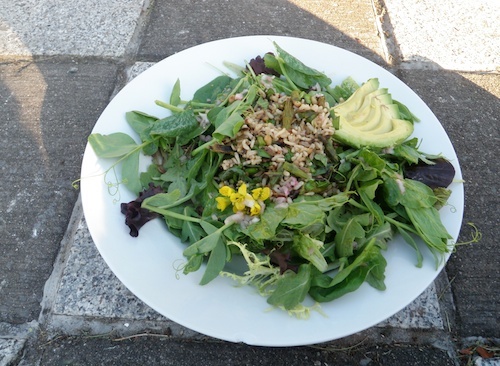 Just bring the greens and the dressed wild rice separately, and mix them at lunchtime. 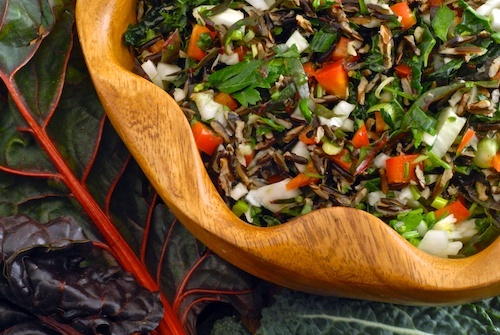 A hearty dinner salad with wild rice, winter greens, fennel and red pepper, with an olive oil and lemon juice dressing. ½ large fennel bulb or 6 oz., prepared and chopped. Combine the garlic, olive oil, salt, and lemon juice to make the dressing. 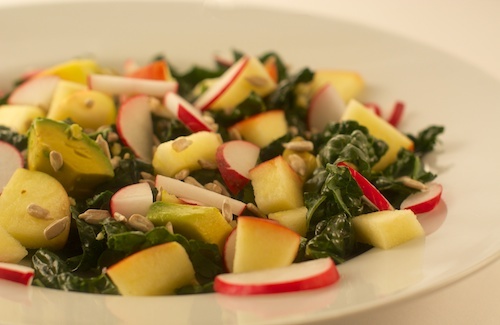 Chiffonade or finely chop the kale and chard. 'Massage' the kale by rubbing some of the dressing into the kale leaves. Mix the rest of the dressing with the cooked wild rice and set the wild rice aside. Wash, trim, and chop the rest of the greens and vegetables. To prepare the fennel: trim off green top fronds and bottom of bulb, wash outer layer of bulb or remove it if it is very dirty or scuffed up. Cut the fennel into quarters, cut the hard pithy center away from each quarter. 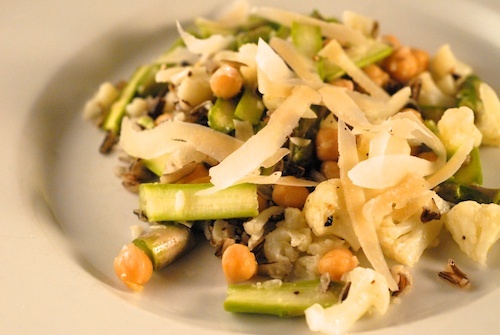 Chop ½ of the fennel into small pieces, save the rest for another recipe. 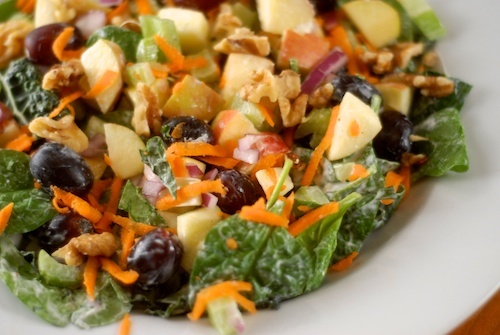 Add each green and vegetable into a large salad bowl after it's been chopped. 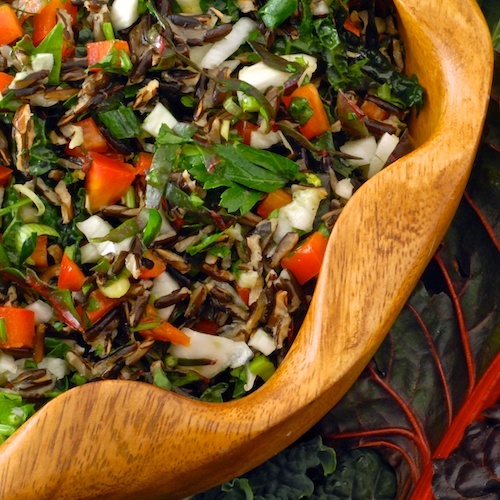 Add the dressed wild rice to the greens and vegetables, mix. Trader Joe’s Kale Waldorf Salad A Kale Waldorf salad with Honey Yogurt dressing inspired by Trader Joe's. This is a wonderful salad. I recommend putting the chiffonaded kale/chard into a large mixing bowl with the salt and “massaging” the salt into the leaves before mixing everything together–this gives the greens a nice texture and ensures that they remain bright green, plus mixes the salt evenly throughout. If you store this salad overnight, you will need to plan on having more lemon and to add just before you serve it, to taste. Thanks for including this recipe! Thanks for stopping by and adding your tips, Laura, I love hearing from visitors! I have to admit that I have not yet tried massaging kale although I hear about it all the time. I’ll have to give it a try. I have now tried massaging the dressing into the kale (though I haven’t yet tried using just the salt). It may have made the kale a little softer as it’s reputed to do, at any rate it was no trouble and I’ve incorporated that step into the recipe. mary recently posted..Happy 1st Blogiversary Fit and Fed!